The submerged arc welding process is called “unter pulver schweissen” in German or “under powder welding” which is a good description of this arc welding process. One obvious implication from the nature of the process is that the welding arc cannot be directly observed. 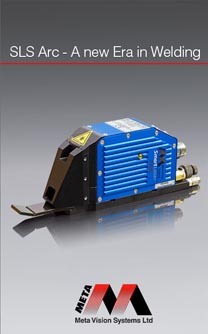 This is one reason why laser seam tracking has long been popular for SAW applications. 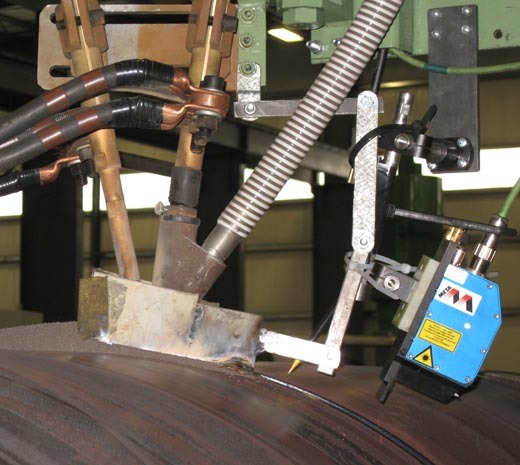 Submerged arc welding is well suited to use with thick welding wire and high welding currents leading to high deposition rates. As a result, it is the leading process in many heavy industrial plants including pipe mills, shipyards, and for many different energy industry applications such as making thick wall vessels for power stations, manufacturing wind towers and for offshore construction. In this photo of OD welding on a spiral pipe mill, grey coloured flux is fed to the weld head through the white striped hose. In this particular case two welding torches are being used – so called “tandem” operation – with the welding current being delivered to each torch by the thick black electrical power leads. The blue SLS laser sensor is detecting the position of the weld joint ahead of welding and using the actual joint position to control the weld head position continuously to keep the welding electrodes (wires) in the correct place in the joint. For welding thick parts, SAW is used in both multitorch and multipass configurations. In multitorch welding, up to six welding torches are used together for maximum deposition at one time. This configuration is typically used in longitudinal pipe welding. In multipass welding, which can also be with multiple torches, more than one run, sometimes many runs are used to fill the weld joint. Multipass welding raises new problems for weld tracking and control, which Meta has solved with its unique DLS scanning spot laser sensor. This photo shows an example of multitorch (three in this case) multipass welding using Meta’s DLS sensor for welding thick cylindrical sections which will become monopiles for offshore wind turbines. 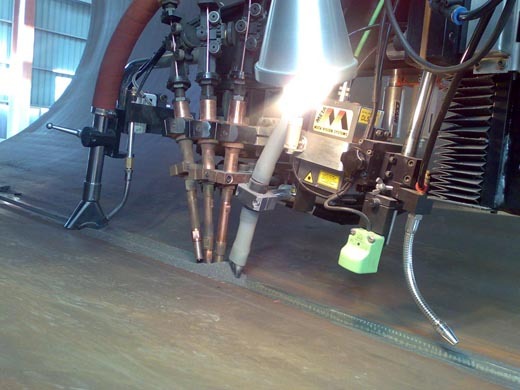 One particularly advanced application of both SAW and Meta’s DLS sensor is in narrow gap welding which is often used in fabricating nuclear vessels. As the thickness of the parts to be welded increases, there are very large savings to be made (e.g. in welding time, consumable usage) by using a very narrow weld joint instead of a conventional vee joint. However, this increases the demands on the welding process including the joint sensing and control systems, see this paper from the Welding Journal for further details.